Plastic Soldier Review - "Shogun"
Home > Features > "Shogun"
"The challenge: Command an army of Samurai warriors, battle for provincial control, and become Shogun." So says the box for one of the larger games in the MB Games Gamemaster Series, Shogun. Open the box and an impressive assortment of playing pieces greet the eye, with pride of place going to the many figures (at least in our opinion). The game itself is very enjoyable, but the figures are the focus here as they are true 1/72 scale miniatures, compatible with the sets of Mongols, Samurai and others produced by the likes of Zvezda. The game is set in 16th century Japan, a century that saw almost constant warfare as different clans fought each other to hold or expand their territory. This was the Sengoku Period, when Samurai armies roamed throughout Japan bringing death and misery on an unprecedented scale. The game represents these armies with a minimal number of figure poses, though these cover the basics and of course they are perfectly sufficient for the game play. On the right can be seen the four types used for the bulk of the armies. From left to right, they are labelled as a samurai swordsman, an ashigaru spearman, an ashigaru gunner (i.e. an arquebusier) and a samurai bowman. The sword and the bow were the principle weapons of the samurai, so these two figures are a good representation of these warriors. The level of detail is surprisingly good - not up to the best standards of the figure makers, but quite good enough for most purposes. Accuracy too is very good. A lot of effort has clearly gone into doing the proper research, despite the fact that as game pieces there is no great need for this. The same can be said for the ashigaru figures, which are much more simply (and cheaply) attired and armed. The matchlock musket was commonly given to these lower-status warriors as it required less training and practice to be effective, but the bulk of the army was filled with these soldiers armed with a simple weapon such as this glaive. Their costume is less elaborate, with the spearman having relatively little armour. The arquebusier is wearing a string of ration bags across his chest - another accurate touch. Both have unusual headgear. The spearman has something resembling the shell of a tortoise, and the arquebusier is wearing something not unlike a beret. However both seem to match contemporary illustrations of ashigaru, and are probably the more pointed jingasa after they have suffered through weather and prolonged wear. 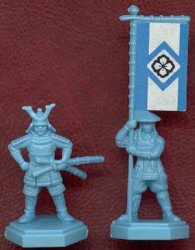 The game also includes a daimyo (like a baron in Europe) and a flag-bearer. Again detail is OK rather than outstanding, but the status of the daimyo is apparent by his more outlandish armour and the horns on his helmet. He stands a model of confidence and power, and makes a majestic officer. The flag-bearer is an ashigaru who is unarmed but performs a very important role in holding one of the major flags. Like all the other pieces, this is moulded as one, without separate weapons etc., and in this case without a separate flag. However the flag is plain, and stickers are provided to decorate them as can be seen here. Both the daimyo and the flag-bearer have varying shaped bases which help identify different armies in the game. Another aspect of the game is the inclusion of ronin, represented by this grey figure. Ronin were simply masterless samurai, so for our purposes this is simply another samurai pose. The pose is actually quite awkward as the man is holding his sword directly above his head. Consequently the intended impression of him swinging his sword is not really achieved well. Finally we come to a fun figure - the ninja. The ninja were specially trained spies and assassins. They were dressed completely in black, with a jacket much like that used in judo today and a hood to cover the whole head except for the eyes. Tight trousers and socks were worn with padded sandals to facilitate the silent execution of their business. This figure looks the part, with his sword on his back and his blade ready to claim his victim. Not the kind of guy you would see running around a battlefield, but an interesting figure nonetheless. In addition, there are the afore mentioned ronin. As these can be hired by any army, they only come in neutral grey. There are 30 of these figures. Finally there is the ninja. Each game contains just one of these specialists. That makes a total of 406 figures in eight poses for each game. The figures have no flash and are nicely sculpted. The bases are rather thick, especially when compared to the Zvezda samurai, yet they look good and are a surprise addition to the ranks of 1/72 scale soldiers.